There is a theory that woman first evolved and used the fairy story, that combination of wisdom and romance, in an effort to tame her mate and to make him a better father to her children. The stories finally became a rude creed, or rather rule of conduct, which softened the treatment men accorded to women. In support of this theory it is pointed out that in the typical fairy story the heroine is often disguised under a repulsive and ugly mask and the man is destroyed by seductive beauties. The old woman, the mother-in-law to the maker of the tale -- let us observe in passing -- is too often a wicked witch who gives men bad advice, and, above all, the stepmother is the incarnation of all wickedness. These first pitiful efforts of women became so widespread and so powerful that we have not yet escaped their influence. We had a remarkable experience at Hull-House this year of the persistence of one of these tales which has doubtless had its taming effects through the centuries upon recalcitrant husbands and fathers. 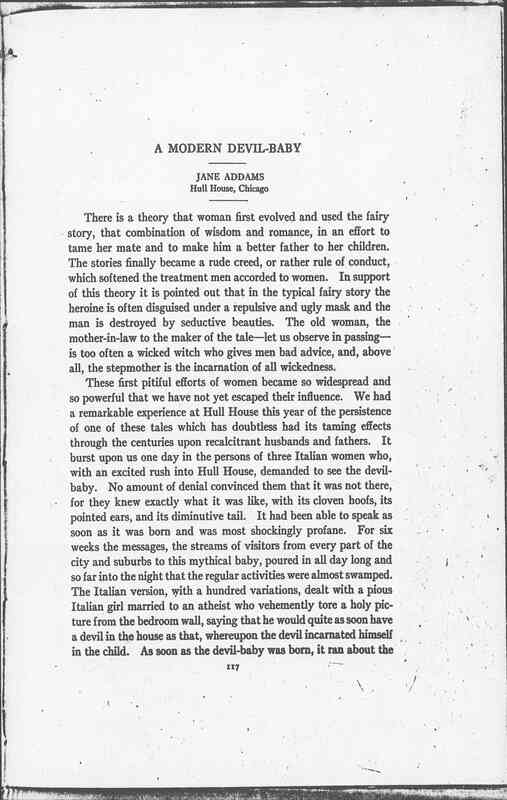 It burst upon us one day in the persons of three Italian women who, with an exited rush into Hull House, demanded to see the devil baby. No amount of denial convinced them that it was not there, for they knew exactly what it was like, with its cloven hoofs, its pointed ears and diminutive tail. It had been able to speak as soon as it was born and was most shockingly profane. For six weeks the messages, the streams of visitors from every part of the city and suburbs, to this mythical baby, poured in all day long and so far into the night that the regular activities were almost swamped. 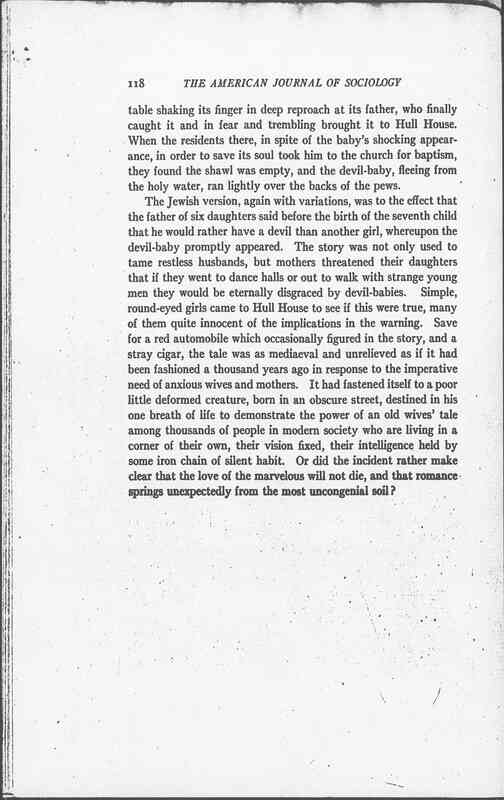 The Italian version, with a hundred variations, dealt with a pious Italian girl married to an atheist who vehemently tore a holy picture from the bedroom wall, saying that he would quite as soon have a devil in the house as that, whereupon the devil incarnated himself in his child. 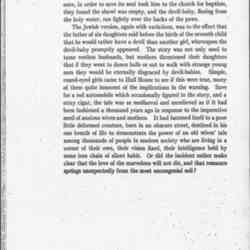 As soon as the devil-baby was born, it ran about the [page 2] table shaking its finger in deep reproach at its father, who finally caught it and in fear and trembling brought it to Hull-House. When the residents there, in spite of the baby's shocking appearance, in order to save his soul took him to the church for baptism, they found the shawl was empty, and the devil-baby, fleeing from the holy water, ran lightly over the backs of the pews. The Jewish version, again with variations, was to the effect that the father of six daughters said before the birth of the seventh child that he would rather have a devil than another girl, whereupon the devil-baby promptly appeared. 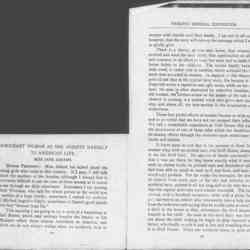 The story was not only used to tame restless husbands, but mothers threatened their daughters that if they went to dance halls or out to walk with strange young men they would be eternally disgraced by devil-babies. Simple, round-eyed girls came to Hull-House to see if this were true, many of them quite innocent of the implications in the warning. 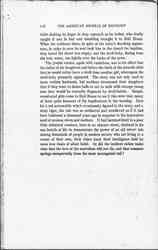 Save for a red automobile which occasionally figured in the story, and a stray cigar, the tale was as mediaeval and unrelieved as if it had been fashioned a thousand years ago in response to the imperative need of anxious wives and mothers. It had fastened itself to a poor little deformed creature, born in an obscure street, destined in his one breath of life to demonstrate the power of an old wives' tale among thousands of people in modern society who are living in a corner of their own, their vision fixed, their intelligence held by some iron chain of silent habit. Or did the incident rather make clear that the love of the marvelous will not die, and that romance springs unexpectedly from the most uncongenial soil? 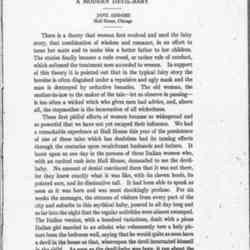 Jane Addams, "A Modern Devil-Baby," American Journal of Sociology 20 (July 1914), pp. 117-118. 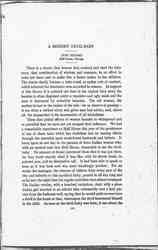 Addams, Jane, “A Modern Devil Baby, July, 1914,” Jane Addams Digital Edition, accessed April 22, 2019, https://digital.janeaddams.ramapo.edu/items/show/9694.